The design may be new for 2019, but its name isn’t. ‘Acoustasonic’ has been used by Fender in the past for a range of acoustic-guitar amplifiers, a Strat-shaped electro-acoustic and most significantly, the previous Acoustasonic Telecaster model, launched nearly a decade ago. A hybrid design hewn from chambered ash with a spruce centre-block, the 2010 model was manufactured in Ensenada, Mexico and fitted with a Fishman undersaddle piezo bridge, a side-mounted Aura preamp and Twisted Tele neck pickup for more traditional electric sounds. 2019’s Acoustasonic Telecaster arrives in an impressively robust FE1225 soft case that feels several cuts above Fender’s usual Deluxe gigbag. Before you say, “at this price, there should be a hard case,” not everyone will agree. For solo performers using public transport to get to their gig with a live rig that consists of simply a guitar and a looper pedal, a high-quality gigbag with backpack-style straps is always preferable to a heavy hard case in terms of comfort and portability. Here, the guitar is well protected by extensive padding and moveable neck cushion-pads, while the bag itself is bolstered against wear and tear by heavy-duty rubber at the corners and around the strap-button area. The larger of the two external pockets also includes scope to keep tools and accessories organised. Inside the bag, we encounter our Acoustasonic Telecaster in perhaps the most polarising of its five standard finishes – Surf Green. We like it, but if you don’t then there’s a more conservative palette of Black, Natural, Sunburst and Sonic Gray from which to choose. NAMM also saw Fender exhibit a range of Acoustasonics in more elaborate finishes such as a distressed stars and stripes design, so don’t expect the book to be closed on colour or wood options. The finish itself is a thin open-pore poly that retains a woody, natural feel – it’s very appealing indeed on a tactile level and isn’t prone to squeaky handling noise. 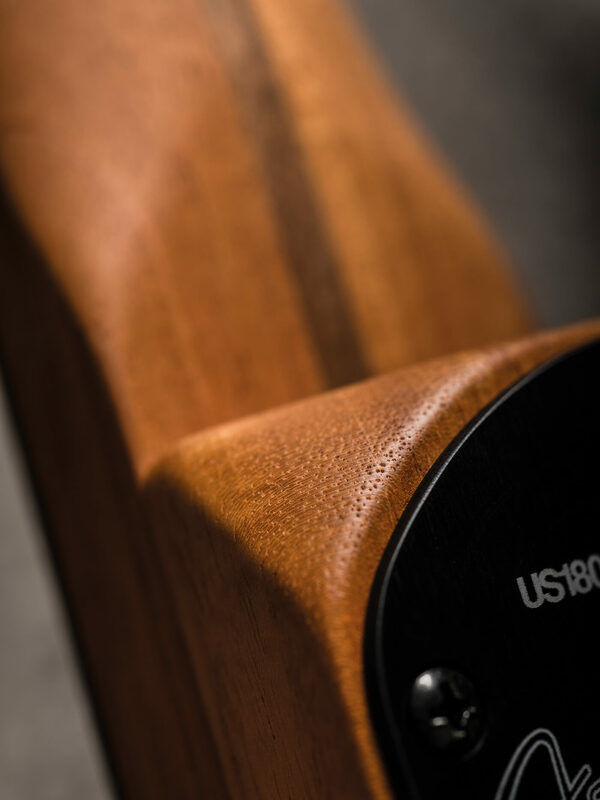 The organic feel is reaffirmed via ebony control knobs – we’d have been tempted to continue this theme by using ebony for the voice selector switch tip and tuning keys, too. 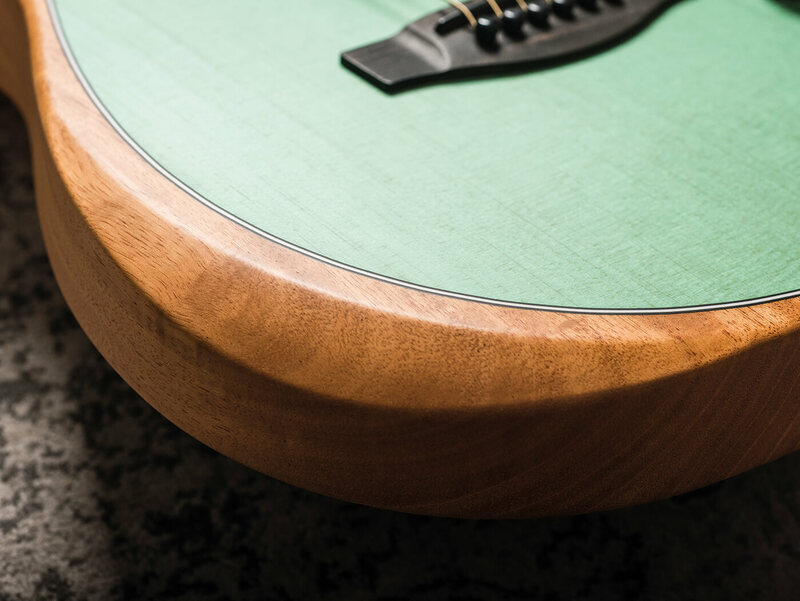 The inset solid Sitka spruce top is home to the semi-transparent Surf Green finish, through which a nicely straight grain is visible. Fender tells us that the top is printed, rather than sprayed. 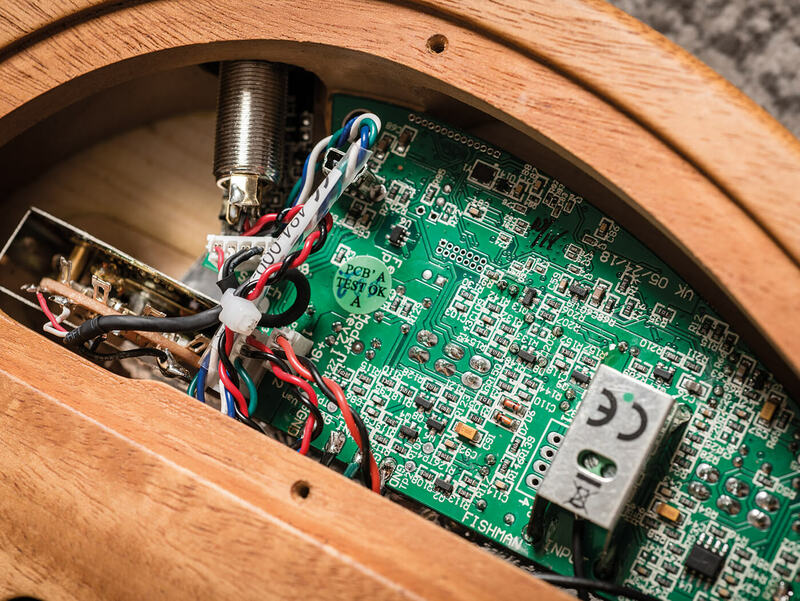 Opening up the pickup cavity around the back gives us a sneak peek at the Acoustasonic Telecaster’s anatomy. The natural mahogany back and sides are CNC routed from two centre-joined sections that act as a ‘frame’ (including the radiused edges and arm chamfer) into which the spruce top is set. 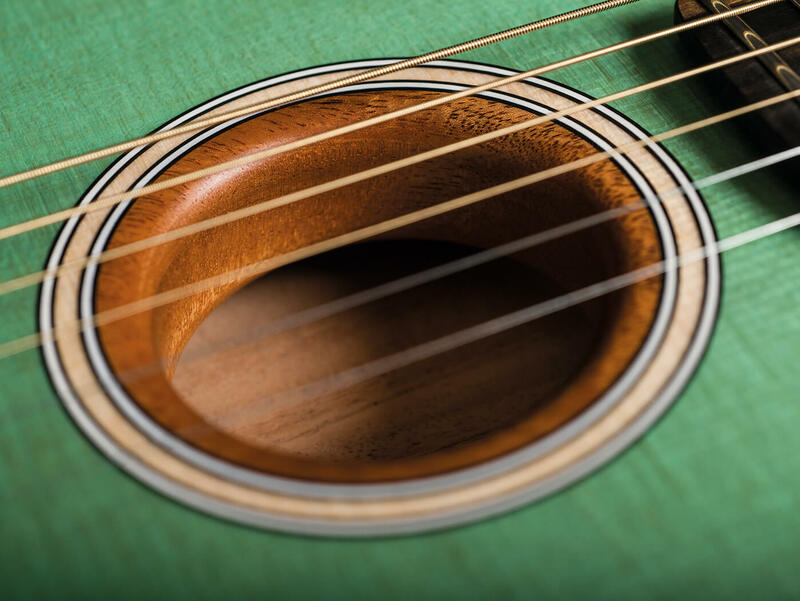 The specially tuned sound port (aka Fender’s patent-pending ‘Stringed Instrument Resonance System’) is a mahogany hoop that’s glued into the soundhole but doesn’t touch the back, while the top itself is supported by a pair of parallel longitudinal ‘transverse’ braces. Almost like archtop bracing, these run the length of the top on either side of the sound port. The neck is mahogany, and it also features an attractive ebony fingerboard with streaks of light brown visible in the upper registers. There was a time when anything less than jet-black ebony would have been considered inferior, but sustainability-conscious players and builders have started to turn received wisdom on its head – and the world of guitar-making is all the better for it. “The design, size, location, and depth [of the sound port] all contribute to the voicing of the instrument and give it a fuller voice on your lap,” says Fender’s vice president of guitar R&D, Brian Swerdfeger. “This voicing, in concert with the movement of the top, are major components of what you hear when the guitar is plugged in. The electronic elements comprise Fishman Under-Saddle Piezo and an Internal Body Sensor alongside a Fender N4 noiseless magnetic pickup. 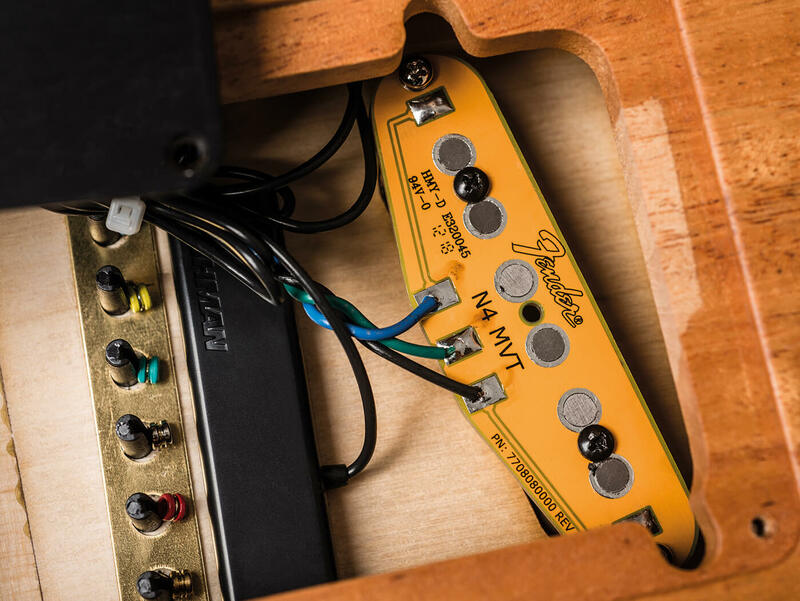 If three pickups were a challenge to combine in theory, in practice, the system allows easy access to a huge array of tones via the five-way blade voice selector, master volume and Mod knob. The latter control blends between two distinct voices in each of the five positions. 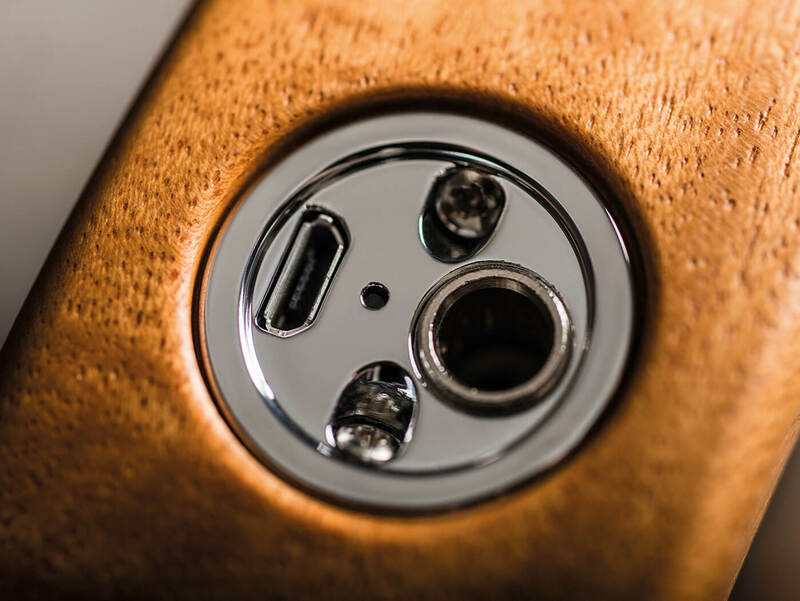 Integrated into the Electrosocket-style output jack plate is a micro-USB connector via which the guitar’s lithium-ion battery is charged. Fully charged, you’ll get approximately 20 hours of playing time, while a blinking red LED is the warning sign that you have less than an hour of battery life left. Helpfully, you can recharge the battery while playing, so there’s no need to panic at a gig if you have a suitable power source on your pedalboard or nearby. In an ideal world, when it comes to that big acoustic number, a singer-songwriter will reach for their pre-war D-45, mic’d immaculately with a pair of vintage Neumanns. Time to rip out that country-fried solo when the band comes in? No problem, the guitar tech is waiting stage-side with a vintage Blackguard Telecaster. The reality, of course – whether you are playing a solo pub gig at an open-mic night, or switching between electric and acoustic in a band halfway up a festival bill – usually involves a considerable amount of compromise on the dream scenario we’ve just outlined. One of the most impressive things about the Acoustasonic Telecaster is that, despite its problem-solving capabilities, it doesn’t feel like a compromise. Instead, it’s an instantly likeable, inspiring tool that opens doors rather than closing them. Purely as a physical object that makes acoustic sound, its louder-than-expected voice is just about perfect for the living room and easy to sing over. And the radiused body edges, forearm chamfer and compact dimensions mean that it sits snugly on your lap. 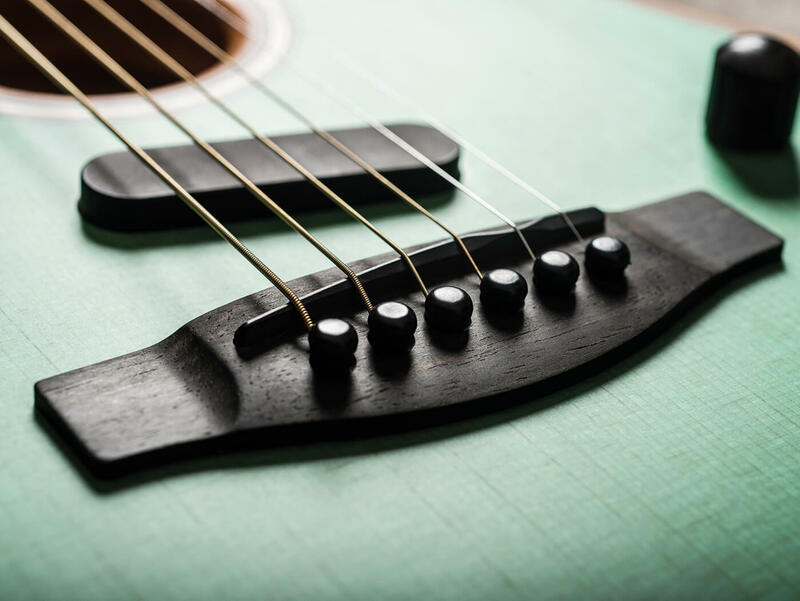 The only downside of the lightweight body is that there’s a little neck dive when strapped on, so if you plan to perform standing with this guitar, then a wide guitar strap will help. Although the open-pore satin finish and supplied Fender Dura-Tone 0.011-0.052 coated phosphor-bronze strings give the guitar a very ‘acoustic’ feel, the appealing ‘Modern Deep C’ neck profile (inherited from the American Professional solidbody series) and contoured heel deliver all the benefits of a comfy modern electric. This includes easy access to higher registers and even full-step bends at the 22nd fret, should the need arise. Lightly rolled fingerboard edges and rounded fret ends make for a smooth and unobtrusive ride for the fretting hand and the deceptively simple Tim Shaw-designed bridge saddle offers excellent solidbody-like intonation. This likely aided by the fact that the top is much less mobile than that of the average X-braced flat-top acoustic. Our first port of call for amplified testing is the instrument’s menu of pure ‘acoustic’ voices, and first impressions are very positive. Piezo-driven sounds are not favoured by everyone, but we’ve certainly heard far more synthetic and brittle-sounding plugged-in tones from the pickup systems on full-bodied, traditionally constructed flat-tops – interestingly, using the instrument through a clean electric amplifier helps attenuate some of the more hi-fi piezo characteristics and makes for a somewhat woodier and rootsier range of tones. The voice selections offer a broad range of acoustic characters based on popular tonewood combinations and body shapes and the ability to sweep through a blend of two voices in each position using the Mod knob is very useful when fine-tuning the way in which a particular part sits in a band mix. Position 5/Mod A’s take on a Sitka spruce/rosewood dreadnought is probably our favourite acoustic all-rounder for both chords and fingerpicking – given the choice, we’d probably trade Position four/Mod A’s Engelmann spruce/maple small-body voice for an all-mahogany parlour tone with more of a dustbowl vibe. 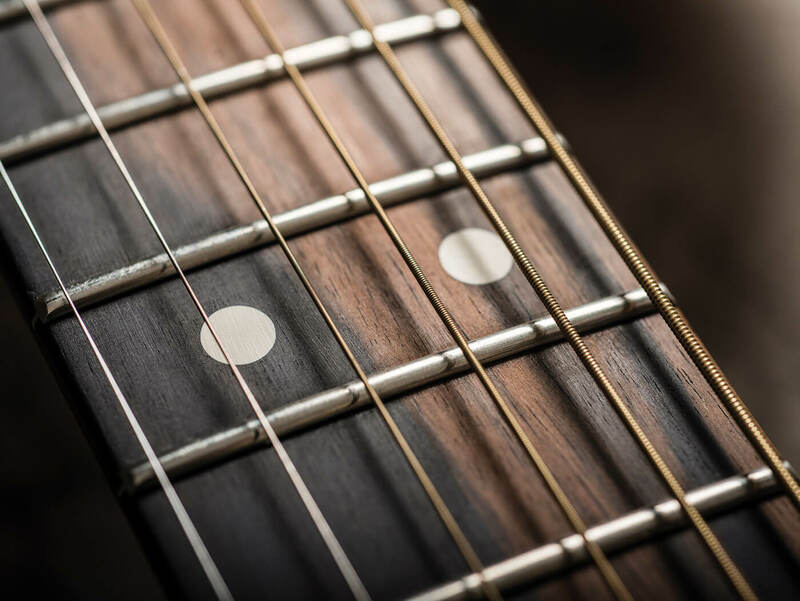 Now you’ve lulled your audience into a false sense of security with your sensitive singer-songwriter schtick, it’s the perfect time to flick the Acoustasonic’s pickup switch to the back setting, where the magnetic pickup comes into play. Position 1/Mod B’s fat/semi-clean electric voice is punchy, gritty and brash without being glassy – even through a dedicated acoustic amplifier or flat-response PA. For 60s beat and power pop, it’s surprisingly dead on (think I Can’t Explain); add some slapback and it’s Nashville honky-tonk all the way, even if country bends are tough to execute with a wound G and 25.5-inch scale length. Tune to open G, add a little more hair on the amp and it’ll do a usable Keef tone, too. Position 2/Mod B’s blend of a Sitka spruce/mahogany dreadnought with a semi-clean electric is another useful voice in a band context, whether for the driving strummed chords of Pinball Wizard, the J-160E tones of the early Beatles, Tom Petty flavours or plenty more besides. Many classic records of the 1960s featured acoustic and electric rhythm tracks compressed into dense mono mixes – not to mention 12-strings, pickup-equipped acoustics plugged into valve amps and all manner of other instrumentation bathing in the warm halo of analogue tape. Perhaps we shouldn’t be surprised, then, that the Acoustasonic feels so well suited to playing the music of, and inspired by, that decade. It’s far from a retrograde design, of course. Position 3/Mod B adds the internal body sensor pickup into the mix with a Sitka spruce/Brazilian rosewood dreadnought voicing, facilitating modern percussive acoustic techniques. Although the body isn’t deep, with some experimentation with the fleshy part of your fist, it’s possible to elicit a kick-drum like thump to complement the rimshot sounds you can create by flicking the top with your fingernails. When playing more conventionally in this position, blending in a small amount of the body sensor to add depth and harmonic interest to the piezo sound also works well. And even if you are no Jon Gomm, in conjunction with a looper pedal it’s a really useful writing tool. Tap out a rhythm on the guitar’s body, loop it up, layer some ‘acoustic’ chords and then flick the selector switch to the back pickup and jam over the top – as an inspirational one-stop platform for songwriting or exploring arrangement ideas, it’s tough to beat. The Acoustasonic will also cover a lot of ground in a function band and you might find that you can get away without bringing two amps to the gig. Less time spent loading out leaves more time to take advantage of the free buffet – always a bonus for the starving artist. 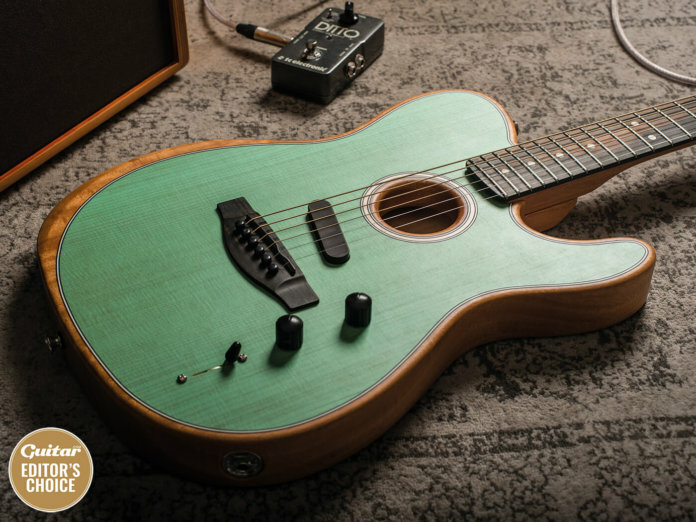 Although there are various ways to slice the acoustic/electric hybrid design and several other companies have brought very credible solutions to market, Fender’s latest attempt is a serious contender. 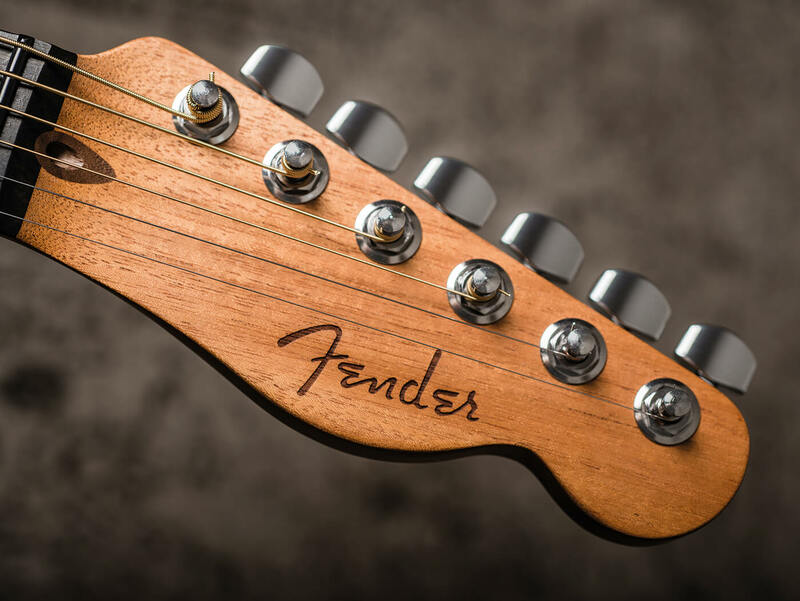 And when that F-brand is etched so artfully into the headstock, it’s immediately a mainstream proposition. The American Acoustasonic Telecaster works well with either acoustic or electric amplification and its small, shallow body offers very good resistance to feedback. Aside from fluid neck-pickup solo tones and heavy rock, it covers a surprisingly wide range of musical bases. If you’re a new-generation acoustic soloist, a bedroom studio songwriter or a function-band rhythm guitarist looking for a do-it-all hybrid for live performance, this guitar should be right at the top of your must-try list.